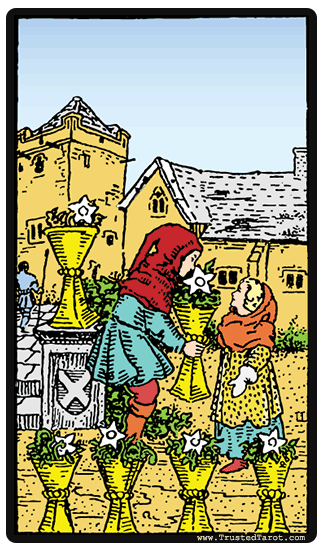 The Six of Cups upright generally represents generosity, naïve happiness, and childhood. It can stand for you wanting to return to a happier time, whether it was when you were a child, teenager, or young adult. Many times, these memories are things of the past, which reflect the aspects of ourselves that have vanished. You may feel that remembering these times is the only way to feel happy. The Six of Cups appearing in a reading seems to indicate that while we may look upon the past with a happy eye, we must avoid living in it. The Six of Cups can also mean that you are be returning to a familiar place. This could be your hometown, an old friend s home, a school, or any place that holds a lot of meaning for you. You are seeking to reconnect with people from your past. Bringing back old memories reminds us of our childhood, a time when things were simpler. You may be seeking the comfort and warmth of people that unconditionally love you. Coming after the Five of Cups, this card can also suggest that you may have suffered a loss or disappointment of sorts, and you are making the journey home. You are looking to the past to find the answer to the crisis or challenge that you are facing now. You may be seeking the comfort and warmth of people that unconditionally love you, gathering strength to face the trials that are in front of you. The Six of Cups reversed can mean that you are clinging to the past. You should explore your memories, but you should not allow yourself to remain there. While you may find it comforting to be in the security of home, you must also learn to forge your own path. The past should be used as a guide for the future. Learn to focus on the present, and truly be aware. Another reading of the Six of Cups reversed is that you may feel as though you are disconnected from your childhood self, and that child's dreams, which may sometimes be unrealistic. Not reaching these goals can be painful, but sometimes reality carves a path for you that you must follow, and you shouldn't blame yourself for your choices. Take the time to think about where you want to be now and how you can reach your goals, instead of just dreaming about them.